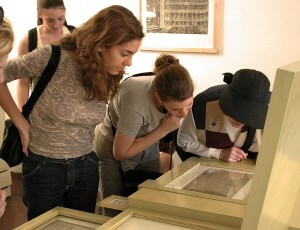 Travelers looking at historic documents in Beethoven's Eroicahaus Museum. Travelers will visit the Mozart museum, called Mozarthaus Vienna. This was his home from 1784 to 1787, and is where he wrote The Marriage of Figaro and many other works. (See the blog on Mozart, Salieri and Amadeus.) Dr. Nelson will also lead a walking tour of Vienna’s 19th district, where Beethoven spent several important summers and where he realized his deafness would be permanent. This walk passes four of the composer’s homes, the little stream he liked to stroll by for inspiration in nature, and visits the Heiligenstadt Testament Museum, where Beethoven wrote his impassioned statement bemoaning his deafness. 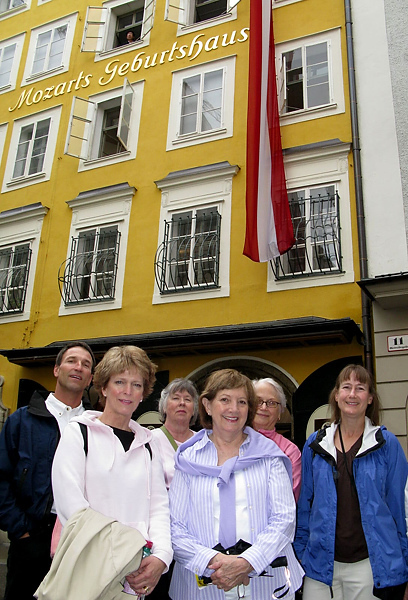 Some of the 2008 group in front of Mozart's Birth House. 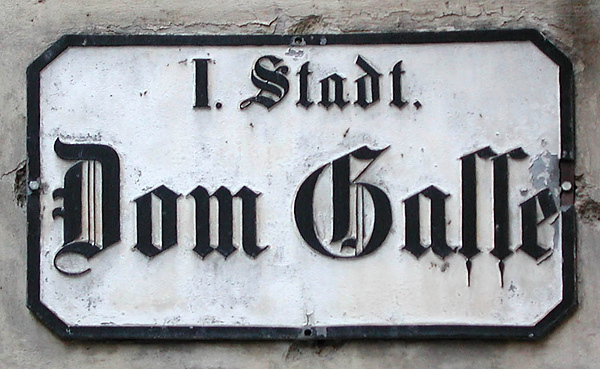 Of course, Salzburg is the birthplace of Mozart and features two museums dedicated to the city’s favorite son. The Geburtshaus (Birth House) has several levels and features different aspects of the composer and Salzburg in the late 18th century. You can stand in the room where he was born and see several of his instruments including his childhood violin. 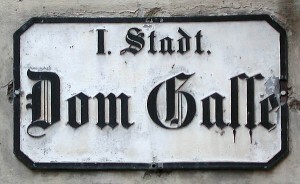 A short walk from there is the Wohnhaus (Apartment). The Mozart family moved there when their first home (Geburtshaus) became too small. 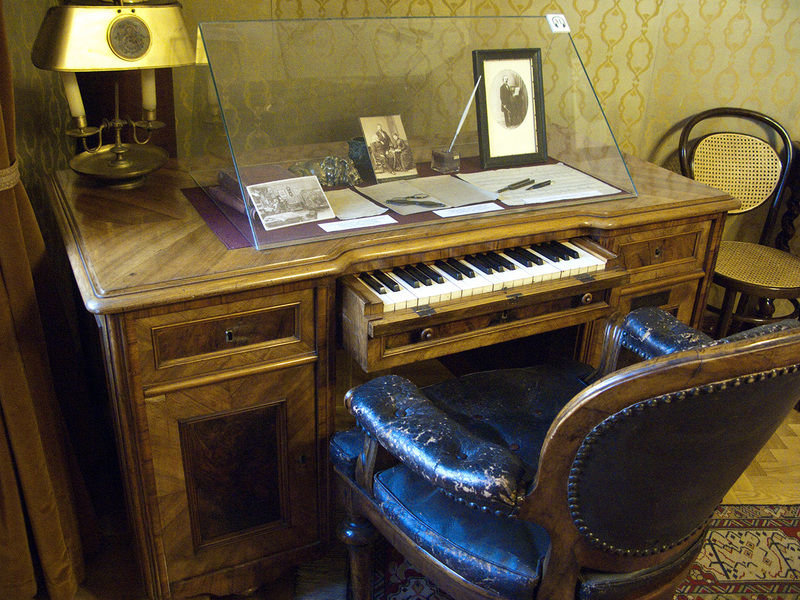 It is now a modern museum with many instruments, documents, and a great movie about the composer’s life. The piano virtuoso and composer, Franz Liszt, spent much of his life in Budapest. Not too far from the Opera House is one of his homes that is now a museum. It has several of his pianos and lots of interesting memorabilia from his life. There is a also a CD recording of Liszt’s music played on his various instruments. It is great to hear the sounds as the composer himself would have heard them.